–Let's Play a Hockey Game! I have no special gift. I am only passionately curious. Written by Kari-Lynn Winters. Illustrated by Ben Hodson. Also translated into Korean. Jeffrey looked at the blank page. It glared back. What would you do if your very own doodle rose up and tried to take over your life? This is exactly what happens to Jeffrey as he tries to overcome his writer’s block. However, Jeffrey learns that even the bossiest doodle is powerless against a well told tale. Read more about this book at Wikipedia. See also an early incarnation of this book, “Jeffrey’s Wor(l)ds Meet Sloth,” in Chameleon Magazine, 2004. The book launch was held in April 2007 at the Vancouver Aquarium, home of some of Canada’s only sloths. A 1-minute video presentation can be viewed in these formats: high quality .mov (8 MB), medium quality .avi (17 MB), and low quality .mp4 (2 MB) (if the sound doesn’t work, try a different browser or download the files to your computer and open them using a different program). WINTERS, Kari-Lynn. Jeffrey and Sloth. illus. by Ben Hodson. unpaged. CIP. Orca. 2007. Tr $17.95. ISBN 978-1-55143-323-3. LC C2006-906077-0. K-Gr 2—When Jeffrey sits down to write a story for his homework assignment, he is faced with a blank sheet of paper and a raging case of writer’s block. He starts to doodle instead, eventually drawing a pudgy sloth. The animal comes to life and begins to taunt him about his writing skills. It doesn’t take Jeffrey long to realize that the lazy animal just doesn’t want him to write about anything strenuous for the sloth to do. He beats the creature (and his own inner critic) at its own game by sending it on an arduous fictional journey in search of the world’s coziest blanket. By the time he finds it, Jeffrey’s homework, and the story, is finished. The theme of the book, that one’s imagination can lead to unexpected places, is not new; nor is the notion of drawings taking on a life of their own. Jeffrey and Sloth is a good read-aloud to introduce units on creative writing to children. 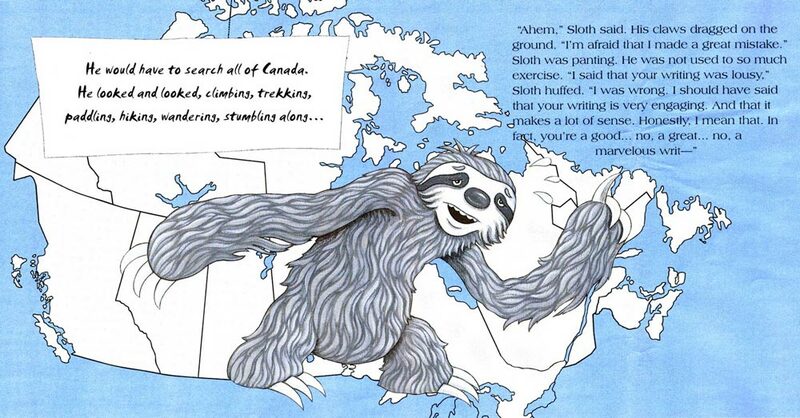 The acrylic and colored-pencil cartoon illustrations of the sloth’s imperative journey add an element of silly fun, though the text crowds them on some pages. As a teacher, parent, and writer, I’m always on the hunt for an indispensable resource. It’s what I pack if my day is going to contain anything unpredictable: a new teaching situation, the hook to launching a unit, an unexpected wait in the doctor’s office. 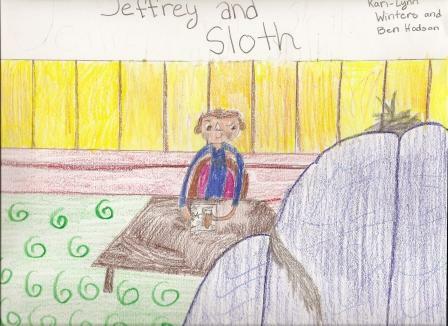 Jeffrey and Sloth is that rare kind of book that works for kids of all ages. Jeffrey and Sloth is a literacy teacher’s tool for inspiring children with a month’s worth of ideas for their creative writing. Primary teachers will want this book as a fun hook for studying Canada. It’s a substitute teacher’s solution to a blank or boring dayplan: scrap the busy work and create a Social Responsibility mini-unit around themes of power and powerlessness. An art teacher could create weeks of exciting lessons exploring the book’s illustrations: patterns, colors, cartoon animation, and teaching students to illustrate their own stories. And I’m just getting started. Imagine what an educator could come up with if she, like Jeffrey, started brainstorming or doodling on a scrap piece of paper. Jeffrey and Sloth is a multi-age enjoyable read. My preschoolers loves the situational comedy. My grade sevens enjoy Winters’ fresh approach to writer’s block. This is a book children and adults – formally or informally – will enjoy for years. Kari-Lynn Winters. Illustrated by Ben Hodson. B.C.’s Orca Books is known for its paperback series for different ages, but it also publishes thoughtful non-fiction and a fine range of picture books. Jeffrey and Sloth is an example of the latter. 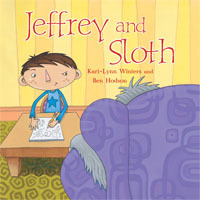 Author Kari-Lynn Winters, who is billed on the jacket copy as an educator, performer and writer, says that the inspiration for writing Jeffrey and Sloth came from a lack of inspiration to write anything at all. And the only lines of type on the first page of the book say, “Jeffrey looked at the blank page. It glared back.” This is a statement any blocked writer can truly appreciate. Instead of telling a story with words, Jeffrey decides to tell one with pictures. The sloth character he creates takes over events, commanding Jeffrey to draw it a chair, a pillow and blanket. The sloth’s rude behaviour moves the artist to begin shaping the animal’s actions in the direction he wants, and the tables are turned. By the end, effrey’s story is one of visual and textual art. Ben Hodson’s wonderfully comic illustrations make readers appreciate Jeffrey’s transformation from downcast to jubilant. The sloth, too, changes from the most elemental schmoo-like outline to a three-dimensional creature with moods and facial expressions that will make readers laugh out loud. Jeffrey and Sloth is a story of the development of artistic expression and empowerment. Bravo to both of its creators. Ellen Heaney is Head of Children’s Services at the New Westminster Public Library in New Westminster, BC. By Kari-Lynn Winters, with illustrations by Ben Hodson. “Good writers have lots of ideas,” the Sloth says, after Jeffrey doodles him magically to life. “You don’t have any!” Not much gratitude from the critical, demanding Sloth, which backfires on the imaginary creature as Jeffrey comes to realize the power an author has over his creations. Not only is the story charming and the moral inspiring (we all have the power to create; ideas lie all around us), but it’s explicitly set in Canada to boot. Makes you want to pick up pencil and paper and see what happens next. Suggested ages: four to eight. Have you ever had to write a report for school and just stared at a blank piece of paper, not knowing where to begin? This is what happened to Jeffrey. Until he started to doodle on his paper, and . . . one of his doodles came to life. His doodle is a long armed sloth that tries to distract Jeffrey from writing his report. The sloth starts to boss Jeffery around; telling him to draw this and that for him. Will Jeffery take back control of his life or will he doodle the rest of his life for the sloth? Kari-Lynn Winters tells a colorful and wild story about taking control of your life, and not letting the little things distract you. She helps us understand that we all have times where we just stare at a blank sheet a paper, wondering where to begin. And that sometimes, `where to begin’ is to write about nothing. Ben Hodson’s illustrations are so vivid and live. Together, Winters and Hodson make this story pop off the page. Jeffrey and Sloth is one of those rare books designed to appeal to all ages. Winters deals with the power of the imagination and creativity on many different levels. Jeffrey and Sloth (Victoria: Orca Book Publishers, ISBN 978-1-55143-974-7, 32 pages), is one of those rare children’s picture books that hold an appeal for both kids and adults. Although recommended for readers ages 4-9, this beautifully illustrated story belongs on the bookshelves of anyone young or old who has a love of writing and a desire to create, be it books, paintings or poems. This is the type of book authors should keep on their reference bookshelf and read when they feel the dreaded writer’s block approaching! Jeffrey and Sloth was Kari-Lynn Winter’s first book. Shortly after publication, it was turned into a stage play by Vancouver’s Theatre and Education Company, Tickle Trunk Players. It was nominated for the 2008 OLA Blue Spruce Award and was a finalist for the 2008 BC Book Prizes, and winner of 2006/7 ABCs of Education Best Books as well as the 2009 Chocolate Lilly BC Reader’s Choice Award. Each of Ben Hodson’s illustrations in Jeffrey and Sloth are magical. The detail in each image draws the reader in and young children in particular will return again and again to this book, not only because of the storyline, but to lose themselves in Hodson’s bright and descriptive acrylic drawings. Kari-Lynn Winters is a graduate of the National Theatre School of Canada. She is also an accomplished poet and an entertaining performer and classroom presenter. Her interactive and informal style has made her a favourite of both teachers and students alike. Educators interested in inviting Winters into their schools should visit her website for booking information. Jeffrey and Sloth is available at all bookstores and also at Books on Board as a digital download. A detailed lesson plan created by Winters is available for downloading in PDF format to help with classroom instruction. Have you ever stared at a blank page, not knowing what to write? That’s exactly what the boy in this book faces. In Jeffrey and Sloth, Jeffrey can’t think of what to write–so he doodles instead. And one of his doodles, a sloth, comes alive–and starts insulting Jeffrey and telling him what to write. At first Jeffrey co-operates, but pretty soon he gets tired of being bossed around by the sloth, and rebels by writing a story about the sloth, making the sloth do what he wants. Jeffrey and Sloth touches on something many writers, artists, and anyone who’s faced homework they hate will identify with–the blank page. Winters’ concept of having the doodle come alive and having Jeffrey be prodded into creating a story is both creative and fun. The beginning text moves quickly and completely swept me into the story, but later some of the dialogue felt a bit clunky, and the story slowed down, particularly when the characters were trying to control each other. I also would have preferred a little less telling and more showing, or allowing the reader to pick up on what was happening. Canadian readers may enjoy spotting the Canadian references. At first the story Jeffrey writes is funny; after being put down so much by the sloth, he writes that the sloth is pudgy, and readers will likely chuckle or side with Jeffrey as the sloth protests. But the book quickly moves into a fight for power, and for me, there was a bit too much negativity–the sloth putting Jeffrey down, and then Jeffrey controlling the sloth and making the sloth go to extremes. I actually started to feel sorry for the sloth, and when Jeffrey smiles when the sloth is thirsty and he makes him swim through a cold lake instead of allowing him to drink, I lost a bit of empathy for Jeffrey. Still, the story ends on an upbeat note, with the sloth “admitting” that the Jeffrey is a good writer (although he admits this under some duress and one wonders how sincere it really is), and Jeffrey finally allowing the sloth to relax and curl up under his blanket, Jeffrey’s homework completed. Through the sloth’s protestation that Jeffrey can’t make him do anything, and Jeffrey’s realization that indeed he can by writing about him, the book may help readers see that through writing their own stories, they can decide what happens, and perhaps feel a sense of control over their lives. Hodson’s acrylic-and-colored-pencil illustrations are bright, lively, and cartoonish, and make the book visually appealing. Hodson has a strong sense of design; Patterns appear on the wallpaper, the floor, and the furniture, bringing a pleasing visual touch. Well-drawn perspective and some use of light and shadow add depth to many of the illustrations. 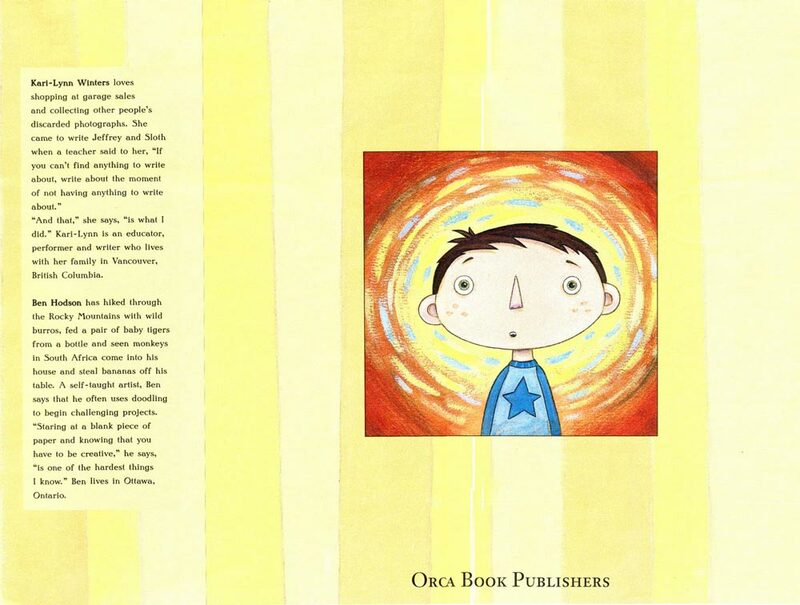 Vibrant colors repeat throughout the illustrations, visually pulling the book together; a rich yellow is especially used in most backgrounds, and purple, blue, orange, and grey also repeat often. The backgrounds often have great washes of color, with little or no details, except in Jeffrey’s room, where there are many believable objects befitting a young boy, including a toy robot and airplane, a shell, a goldfish bowl, various balls, a model volcano, and posters on the wall. Jeffrey’s doodles, appearing as black pencil on white paper, are sweetly drawn and come alive, the line moving from a smaller image of Jeffrey and his page to a larger page where readers can see what he’s doodled. 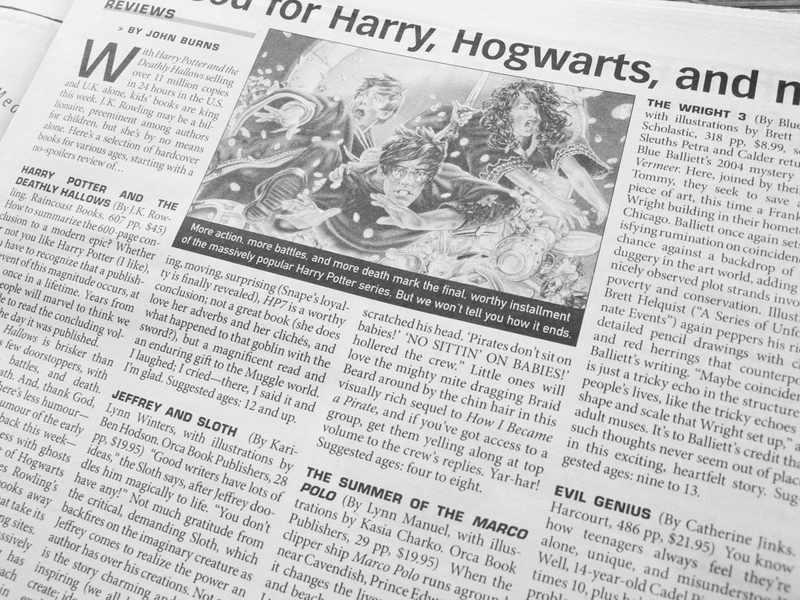 In other illustrations, Jeffrey’s doodles appear on his page in front of him, where readers can view what he’s drawn. This has great visual appeal. The objects Jeffrey draws for the sloth that appear in his room are 3-D, like the rest of Jeffrey’s furniture, and fit in beautifully. White lines are drawn around the images as they “appear” in the room, bringing a sense of magic. The illustrations bleed right to the edges of the pages, and vary from one per page to a full spread, with some smaller illustrations appearing on top of others. Two different fonts make a nice differentiation between the story and the story Jeffrey writes, and this distinction is increased by Jeffrey’s story appearing on small pieces of white paper. There is a bonus illustration on the inside title page that adds to the story, where Jeffrey arrives home carrying his backpack and hat, staring glumly at the blank pages of paper and the pencil waiting on his desk. Observant readers will enjoy spotting the sloth appearing on a pinned-up poster on Jeffrey’s wall before he even begins to doodle him, and noticing that the map that the sloth travels over is also pinned up on Jeffrey’s wall. Jeffrey and Sloth encourages creativity, creative writing, doodling, and art. Readers may want to try to make their own doodles come alive, putting words to their own stories. This is a fun one. It’s the story of Jeffrey who can’t think of anything to write, so he doodles. His doodle, a “round-bellied long-armed sloth”, dontchaknow—and a pretty bossy one at that—starts telling Jeffrey what to write. At first, Jeffrey complies, but then writes his own ideas about what Sloth should do. Oh, what power the written word wields! Jeffrey and Sloth was a finalist in the 2008 BC Book Prizes, which just goes to show… when your teacher says, “If you can’t find anything to write about, write about not having anything to write about.”, do it! Kari’s always fun to have at book events because she sings…and has great puppets. It’s been a while but I’m back to the challenge! I have the tiniest reprieve between my fall/winter courses and my summer courses in which I’ve had the time to do a bit of reading. 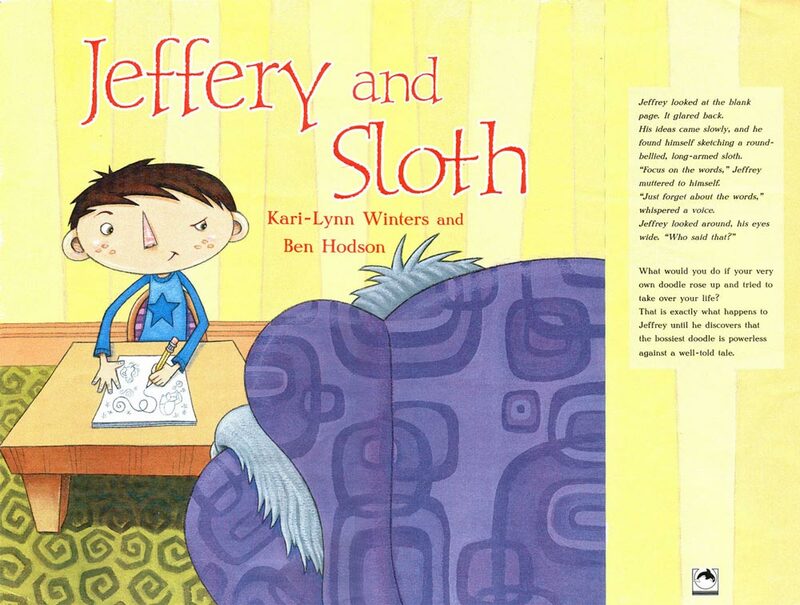 One of the books I read was Jeffrey and Sloth by Kari-Lynn Winters and illustrated by Ben Hodson. I went to the bookstore to buy this book and when I was standing in line a little boy behind me said “I know that book! It was part of Blue Spruce!” so I asked him if he liked it and he said yes but that he voted for a different one. I think the Ontario Library Association’s Forest of Reading program is a great idea because it allows kids like that little boy at the bookstore to choose the books that they think deserve awards instead of having grownups do the choosing for them. This book really spoke to me because although I’ve always wanted to write and I have a bit of a creative streak, sitting down with a blank page/computer screen to write something has always been a huge challenge for me. The task seems so enormous that I can’t get started and end up distracting myself with other things. Jeffrey’s character is a believable and realistic one and his conversations with a sloth, who wants to do nothing but nap in a comfy chair with a puffy pillow and a perfect blanket, are filled with humour and references to the Canadian landscape. The group of girls in my after school program were giggling at the ordeals Jeffrey puts poor sloth through. This really is a cute new addition to Canadian children’s literature. Staring at a blank sheet of paper (or computer screen) can be awfully daunting when you can’t find anything to write about (or blog about). For Jeffrey, the solution is to draw a shining sun, snow-capped mountains, space aliens and a round-bellied, long-armed sloth. Jeffrey’s sloth suggests that Jeffrey should make himself useful and sketch a chair. Before long, Jeffrey discovers that his drawing and words are magical – with them, he sends his creation digging, swimming, climbing and trekking. Good fun – especially for a young writer seeking inspiration. Why not try doodling your way to your next tale? “This book is for grade 2’s. It would tell them that drawing can give you writing ideas.” (Kevin, grade 7). Suffering from writer’s block? What do you do? Most of us doodle- even if all we can draw are stick figures! Are you a doodler? ‘Jeffrey and Sloth’ will make you think about WHAT you doodle! Jeffrey suffers from writer’s block so what does he do? He begins to doodle and one of his doodles comes to life. His doodle is a long armed sloth that keeps bugging Jeffrey so he can’t write his report. The sloth bosses Jeffrey around asking Jeffrey to draw certain things for him. Winters tells a creative and fun story about taking control of your life and not letting little things distract you. Find out what happens to Jeffrey and Sloth in this creative picture book that confronts the power of the written word! ABOUT THE AUTHOR: Kari was born in St. Thomas, Ontario, Canada. Her urge to travel and explore different cultures has led her to live in locations all across North America. She now lives in Vancouver, BC. She attends the University of British Columbia as a Ph.D. candidate and instructor in the Language and Literacy Dept. Kari enjoys being in the classroom, as a student, a teacher, and as a presenter. She has recently completed her masters thesis on exploring the efficacy of using the arts to strengthen less proficient students’ reading comprehension (part of her multimedia thesis presentation is available online). Before that, she taught in North Carolina for three years and in Toronto for 2 years. Kari holds a teaching degree from the University of Toronto, in regular and special education for children ages 3-13. She is also a graduate of the National Theatre School of Canada (in Montreal), where she earned a certificate in technical theatre. Kari has also written numerous magazine articles. 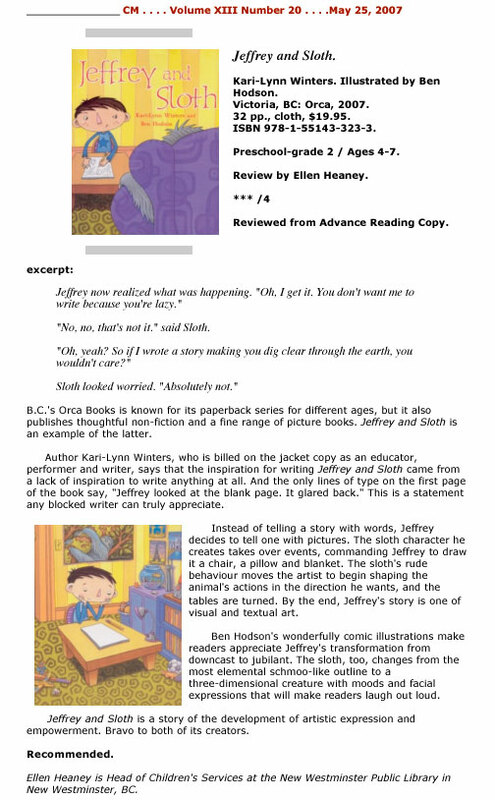 ‘Jeffrey and Sloth’ has received many positive reviews and was a top-10 finalist for the Blue Spruce award. How did you get the idea for ‘Jeffrey and Sloth’? I got the idea for Jeffrey and Sloth from a professor at UBC. I was asked to write a story, but couldn’t think of anything to write about. I told my professor that I was struggling and he said, “If you can’t think of anything to write about, write about having nothing to write about.” And that is what I did. How long did it take you to get from idea all the way to published with this book? A year and a half (or 32 re-writes). I love that this picture book is about the daunting task of overcoming writer’s block. Do you have any suggestions for writers on ways of overcoming writer’s block? There are strategies for overcoming writer’s block right in the book. When in doubt do what Jeffrey does. Ask questions about their doodles. For example: a) Which doodle should I write about (remember, inanimate objects can come to life as well)? b) Where will my story take place? c) What might be a problem that arises between my doodled characters? Doodles can say a lot about a character’s particularities. Writers can decide how their theme/big ideas are supported: Writers might use adjectives to describe their doodled characters. For example, Sloth is lazy and bossy. Once the particularities of the characters are determined, the writer can assign goals for their characters. For example, Sloth is lazy. He wants to sleep. Next, writers can support their ideas through their characters’ objectives. If Sloth wants to sleep, what will he need to sleep or to sleep better? Writers might think about what stands in the way of their characters achieving these goals (e.g. another character, their environment, themselves, and more). In Jeffrey and Sloth, Jeffrey’s own goal of getting his homework done stands in Sloth’s way. Stories are everywhere. As a writer it is your job to find them. Writers can look for story ideas in their environment. After reading Jeffrey and Sloth, study the first illustration as Jeffrey looks at the blank page. What do you notice about Jeffrey’s environment—the sloth poster, the fish, the map of Canada, and so forth. Writers could look closely at their own environment and incorporate some of these ideas into their stories. I understand that you also wrote a children’s play, ‘The Meaning Maker’. Compare the differences of writing a play and writing a picture book. There are differences between writing a picture book and a play. First of all, there are limitations of space when you write picture books. Only so much can happen on one double page spread. I try to have 30 words or less and only 1 or 2 major bits of action per double page spread. When dealing with plays, there is less of a concern about the physical number of words per paragraph, but there is a restriction on the types of actions that can happen. For example, a stage character might have trouble doing a triple flipping twirl (particularly without copious amounts of rigging). Also things can’t transform as immediately on stage as they can in a picture book. Without magic or expensive special effects Sue cannot be transformed into a dragon right before your very eyes. When writing picture books, the writing is more of a finished product than a stage play, (especially when you act in your own plays). On stage, the audience feeds me. As a writer, I have an opportunity to alter each performance based on the audience’s needs and reactions. Picture books can have numerous characters. However, if you take a look at the Plays section of The Writers and Illustrators Marketplace, a high percentage of the guidelines listed in this useful resource call for plays with only three to four characters: a very small number. Many of the companies buying rights to original plays are ensemble groups with a small core of actors — and small budgets. Dialogue in picture books might be short and snappy, but it is complete. In plays dialogue is broken, overlapping, repeated, questioned, interrupted, and shortened. Illustration and words can reveal much about a character in picture books. Beyond images and words, there are other ways to convey meaning in plays (e.g. music, lights, set design, costumes, props, and so forth). Writing a play is not only visual and verbal, it is a 3-dimensional experience that is visual and verbal, but also sensory and embodied. How did your experience as a teacher influence your career as a children’s writer? My background influences me in so many ways. Besides picturing some of the children I have worked with (e.g. remembering what they thought was funny, how they acted, and so forth), I also bring to the page the connections that I have made in the past and the ideas that are important to me. I have strong ideologies about literacy and pedagogy (e.g. all children deserve the opportunity to read and write, writing can empower a child, and so on); I can’t help but bring these to the page. Runaway Alphabet is an alphabet book that is coming out with Simply Read Books (An award-winning local company) in the fall 2008 or spring 2009. It is a book like no other. It focuses on the sounds of the letters. I can’t wait until this book hits the shelves. It is exactly the kind of book that I needed as a child. When Chickens Fly was accepted for publication by Raincoast Books. However, unfortunately because of a recent business decision (Raincoast will no longer be creating books) this project has been abandoned. I do hope another company picks up this book though. It is a story about a chicken that isn’t allowed to compete in the Olympics because she is a chicken. In many ways this is a story about discrimination. PunctuACTION is a book about punctuation and the meaning of these wriggly little symbols. This book empowers the main character and helps her to learn grammar in the process. This book will be coming out with Gumboot Books (another great local company) in 2010. I am currently working on a sequel to Jeffrey and Sloth. I am keeping my fingers crossed that Orca Book Publishers will accept it. I also enjoy writing for Magazines. I have two new stories out this month. One is in ChickaDEE. Extreme Rollers is all about a boy who likes to sleep in and the advantages/disadvantages of technology. The other story is with KNOW Magazine. The Mightiest of All is a circular story about Australian food chains. It’s a great piece to act out. 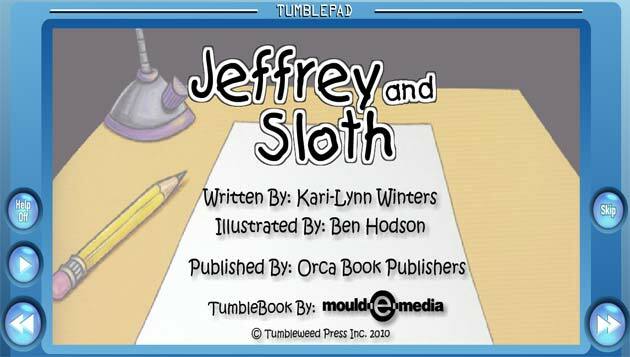 Teachers can find a lesson plan that accompanies Jeffrey and Sloth on the Orca Book Publishers’ website under teachers’ guides. Jeffrey and Sloth can be adapted as a classroom doodling and writing exercise, as for example outlined by Keisa Williams at jeffrey-and-the-sloth-by-kari-lynn-winters-book-review-lesson. Kari is available to visit schools, libraries, birthday parties, workshops … Please see more about author visits.